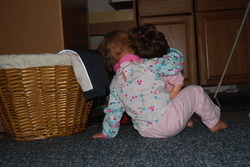 A couple of weeks ago, Mary Beth, Katie, Karoline, and our friend Mackenzie were playing in Mary Beth's room. The girls were dancing and Kara was watching--and wanting. To Dance. Mackenzie asked if she had yet taken a step and--just as Mary Beth was answering in the negative--Karoline took three such steps. There were squeals and shouts and lots of "Mom, you'll never believe it!" And I didn't. Because I chose to deny it. That was pretty easy since I didn't witness it:-). 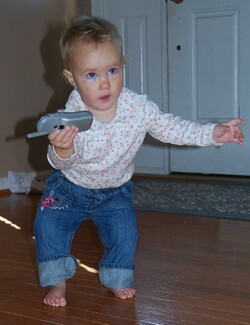 Then Karoline did it again and again and I was forced to admit that she is indeed learning to walk. Karoline has never crawled. Instead, she scoots along on her bottom and propels herself forward with her right leg. This is a very useful means of moving. 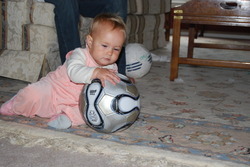 A baby can get herself all over the house, while holding a doll or a ball or Mommy's cell phone. There is no need to walk. She's upright and very fast! Because she spends so much time this position, her left foot and lower leg curl in considerably. While she can bear weight and stand up straight, she has not gone from those few steps to full blown walking very quickly at all. Instead, she usually takes two or three steps at a time and falls over that left foot. Yesterday, she put several more steps together and looked at me with a grin of perfect satisfaction. She is my eighth baby. I know the signs. By Monday morning, my baby will scoot no more. She will be walking. By the grace of God, this happens to be the first weekend since the middle of August when my husband will be home all weekend. It's also the first weekend since the middle of August when my eldest son will be home all weekend. Karoline knows her audience. It's going to be quite a weekend, a rare moment in time. We're all together, watching our baby become a toddler.